The Smart Home Planner helps consumers measure the relevance of different smart home lifestyle patterns and solutions to their daily life. This information can be very useful in helping them select the smart home automation and entertainment products they will value, use, and enjoy. 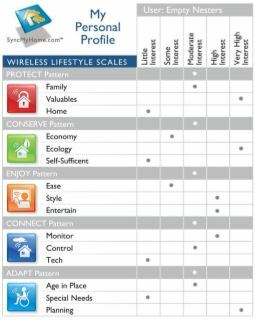 If you have not already done so, please visit the Lifestyles section, and complete the Smart Home Planner. When you’ve finished it, you’ll immediately receive a Personal Profile that summarizes your results. This INSIGHT report will help you understand your Personal Profile, so you can tailor smart home technology to your lifestyle. It will walk you through examples of three prototype households, to illustrate how the Lifestyle Patterns are used to guide the selection of specific home integration features, and then fine-tuning the selections to a household’s needs. PROTECT: Guard your family, your possessions, and your home. Family—Insure the safety of household members. Valuables—Keep valuables and keepsakes secure. Home—Protect the home’s structure from damage. CONSERVE: Save money, resources, and enhance self-sufficiency. 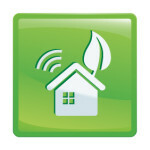 Economy—Conserve energy and save money. Ecology—Protect the environment by conserving resources. ENJOY: Entertain with comfort, convenience, and style. Ease—Embrace home automation for comfort and convenience. Style—Home as a reflection of personal interests and taste. Entertain—Home as a stage for leisure and social activity. CONNECT: Check up on your household and manage it remotely. Monitor—Keep track of your home and household members. Control—Monitor, adjust and optimize the home’s systems. Tech—Embrace technology to simplify daily living. 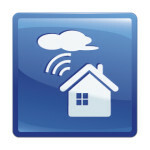 ADAPT: Support independent living with smart home integration. Age in Place—Help seniors live securely and safely at home. 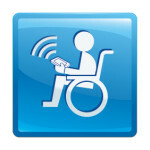 Special Needs—Use home automation to support independent living. Planning—Plan for the mature years, for loved ones or yourself. Understand the Profile. First, identify the Patterns with the highest scores, and note which of the underlying Components are also elevated. For example, if the highest Pattern scores are PROTECT and ENJOY, look at the Family, Valuables, and Home Components (for PROTECT) as well as Ease, Style, and Entertain (for ENJOY), to see if any of these Components are low. Low Component scores reduce the overall Pattern level, and also help focus your decision making. High Component scores for Patterns that score low overall pinpoint specific needs in the absence of a strong general interest. These, too, should be noted. Suburban Family with Children. For this Profile (see below), the highest Pattern score is for CONNECT, with the three underlying components also at the highest level. The PROTECT pattern is high, along with the Family and Valuables components, but the Home component shows only some interest. ENJOY and CONSERVE Patterns are moderate, and ADAPT is low, but the Age in Place Component is moderately high. Household. You are a young family with two preschoolers, and you rent in a suburban area. You and your wife work full time in a nearby city, and your mother-in-law lives with you. She takes care of the kids, but you bring in outside help when she is gone, and doing this makes you both nervous. Also, your own mother—who is widowed—lives in a neighboring state, and has begun to have significant health problems which cause periods of fatigue and absent-mindedness. These are increasingly a concern to you. Analysis. With young children at home, family protection is paramount, especially when grandma is away. You also are concerned about protecting some heirlooms that you’ve inherited. Because you rent, you’ll let the landlord worry about the house itself. And since you’re just getting started financially, you’re drawn to the cost-effectiveness of wireless home integration solutions. It’ll be easy to move the equipment later when you buy your own home. You and your wife particularly like the idea of overseeing things from your smart phones, to make sure everything is OK when you are not home. You’ve already begun to have “what if…” discussions with your siblings about your own mom’s safety, now that she lives alone. Everyone has expressed concerns about the financial burden of assisted living, but you are more worried about the emotional impact of her giving up the home that has meant so much to her over the years. Action Plan. You agree there’s a need for a well-designed intrusion alarm system to protect the family and heirlooms, as well as security cameras to oversee childcare when you’re both at work and grandma is away. Integrating these into your smart phones is an easy decision. With regard to your own mother, you and your sisters have agreed to contact a senior services specialist in her area to discuss specific problems that might be addressed with adaptive smart home solutions, so she can continue to live at home as long and as securely as possible. Empty Nesters Move to the City. This profile (below) shows moderate interest levels across the five Patterns, but significantly high or very high component scores are scattered throughout. They include Valuables, Ecology, Style, Entertain, and Planning. All other component scores indicate relatively low interest levels. Household. With the kids well launched, the old nest empty, and retirement close at hand, you and your husband decide to move back to the city to be close to your work, your friends and your passions: art, theater, and music. You’ve bought a condo in a nice area, so security isn’t a big concern—except for the collection of American folk art left to you by a beloved uncle. Several pieces are valuable, but they all have great emotional importance. You and your husband are comfortable financially, but are concerned about energy consumption, and want to do all you can to reduce your carbon footprint. And with many of your best friends nearby, you plan to ramp up your social life with lots of entertaining in your new home. Analysis. Although your neighborhood is generally safe, you would be spooked by the thought of anyone breaking into your home, and devastated if anything happened to your beloved art collection. So you need absolute protection from intruders, with special attention to the artwork. Smart home automation that saves energy—for lighting, heating and cooling, even shade control—is also welcome. These features will serve double duty when you sit down to entertain your friends in style. And now that you’ve settled into all of this comfort and enjoyment, you’ll want to remain in this home for as long as possible into your retirement years. Action Plan. Complete intrusion control and surveillance are essential, and must be designed for ease of use. Neither of you is all that comfortable with technology (you’re still struggling with your smart phone). And if anything should happen, you want the right people notified automatically, so they can help handle the situation—especially when your are travelling. Smart home automation will save energy and help you entertain in style, so you’re all for it—but it’s got to be easy to use. As you discuss your current goals with the system designer, you’ll also want to mention your long-term plans to “age gracefully in place.” With all the new home integration features that can be adapted to meet the special needs of seniors, you’ll find that conversation very reassuring. Dignity and Comfort in the Mature Years. This profile (below) reflects mostly ADAPT and PROTECT interests, both of which are highly elevated, as are the following components: Age in Place and Planning, as well as Family, Valuables, and Home. The other Patterns show lower interest, but two components, Ease and Monitor, are high. Analysis. You are committed to staying in your home as long as possible, and are willing to make whatever arrangements are needed to help make things safe and secure—and your children free from worry. 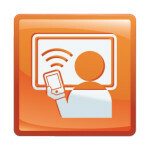 Although electronic technology is beyond your grasp, your children all rely on it every day. They are urging you to install security and surveillance, plus motion detectors on lights outside for security—and inside for your own safety when you get up during the night. They even want the system to automatically phone them or send them a message if anything doesn’t seem right. Action Plan. Your children arrange a meeting with a local expert at your home. After everyone has a say (including you, where you make it clear that safety concerns mustn’t override your needs for privacy), the system designer suggests: simple but complete intrusion alarm; motion detectors on exterior lighting for security; motion detectors with override on the garden lights (so you can enjoy the view at night when you choose); and interior surveillance cameras in critical locations (bath, bedroom, and kitchen). To protect your privacy, the cameras in sensitive areas will be programmed to record and send alerts to your children (plus a trustworthy neighbor) only if something does go wrong. The designer also mentions other specific adaptations (such as remote monitoring of water flow, appliance use, door locks, etc) that could be added later if the need arises. This plan meets with everyone’s approval, and you agree to move forward. Interpreting Your Own Profile. Now that you’ve gotten a feel for how smart home integration can address everyday lifestyle concerns, it’s time to dig deeper into your own results. What do the high and low Pattern scores reflect in the daily life of your household? What ongoing concerns and needs are reflected in the high components scores? How do these results relate to your home and neighborhood? And which everyday problems can smart home integration solve for you and your household? To learn more about specific features, visit the Gallery sections or other Insights Reports. Call the Experts. OK, you’ve visited the Gallery sections to learn about the technologies, and reviewed your Personal Profile to clarify your Lifestyle Patterns. Maybe you’ve even read some of the Insight reports to expand your knowledge on topics that relate to your high scores. Now you’re ready to meet with a local pro, who can help you refine your ideas, and show you how specific features can be used to address your particular needs and preferences. See Find an Expert. Your Personal Profile will help facilitate this process, so if you’ve completed the Smart Home Planner, make sure to have it available.